I have a new better way of making yogurt. Go here to see it! I have been making my own raw milk yogurt for over 2 years now. It really is quite simple once you get the hang of it. Along with having great healthy bacteria benefits and a good source of healthy fat, yogurt is just plain yummy! 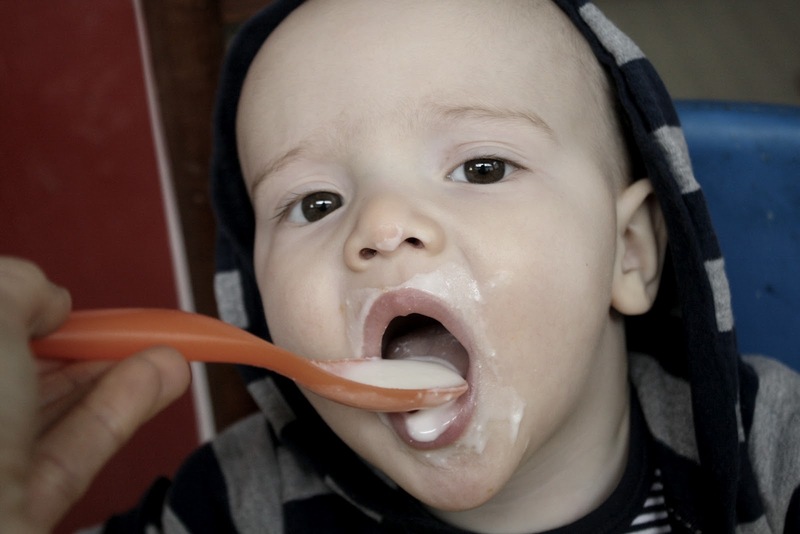 We use it for fruit smoothies, eat it for breakfast and it's one of the first foods I feed my babies. Although the heating process I use to make yogurt does kill of some of the good bacteria it is still tons better than any store bought yogurt, which is just loaded with sugar. Even plain yogurt has sugar! Side note: There is a way to make yogurt without heating the milk. Although, I have never tried it. 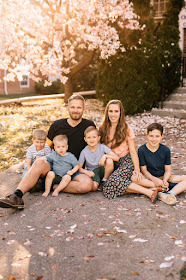 Read here for more info. 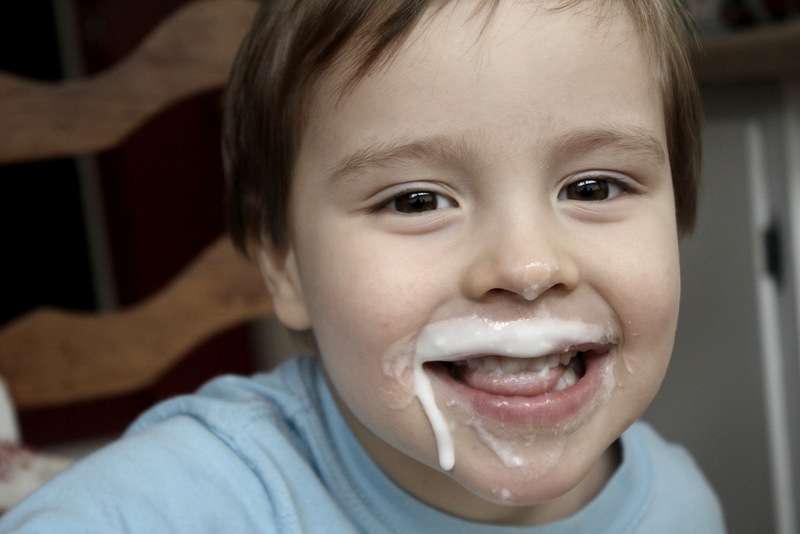 I currently use raw cows milk, but you can definitely use store bought or goats milk as well! 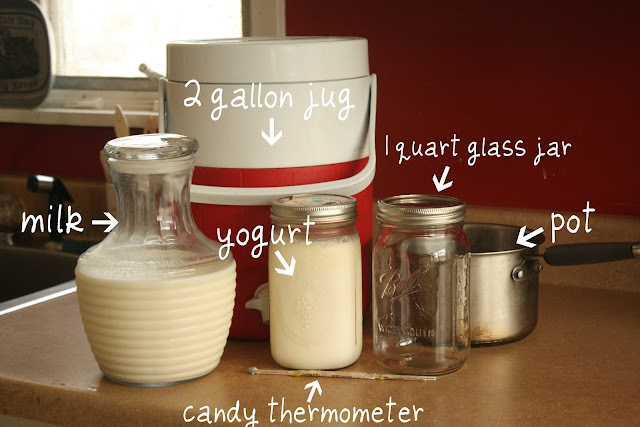 Here is a step by step on how to make yogurt! 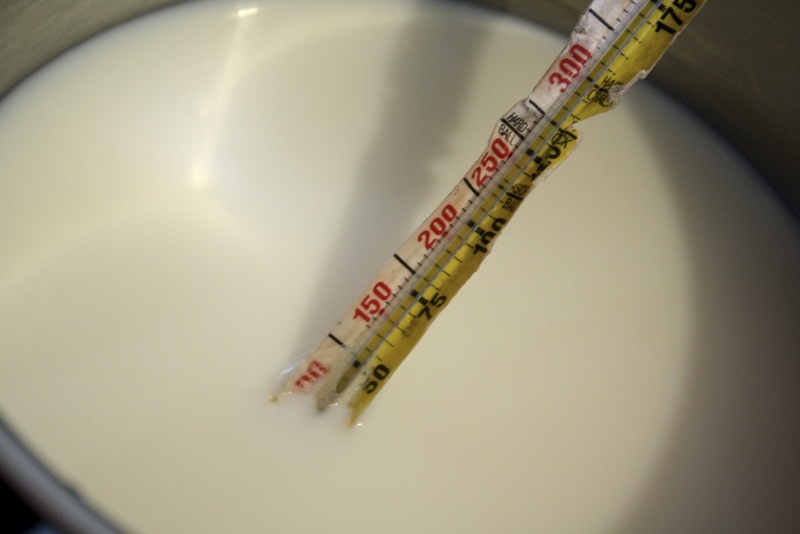 Measure out your milk in a 1 quart jar, stopping at least 1 1/2 inches from the top. It'll be around 3 cups. Pour the milk into your pot, and put over low/med heat, leaning more towards low. 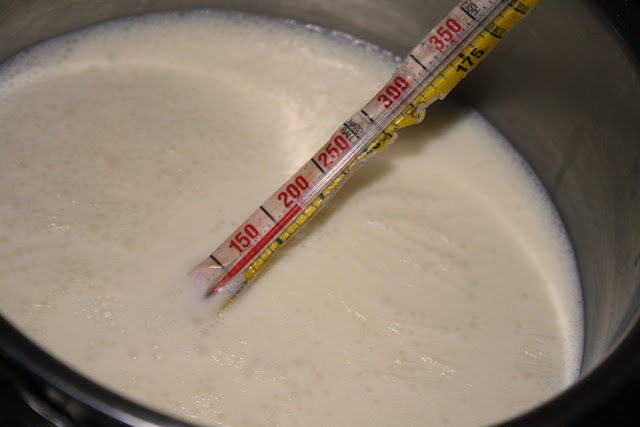 The lower and slower you heat up the milk the less the enzymes and bacteria become damaged. 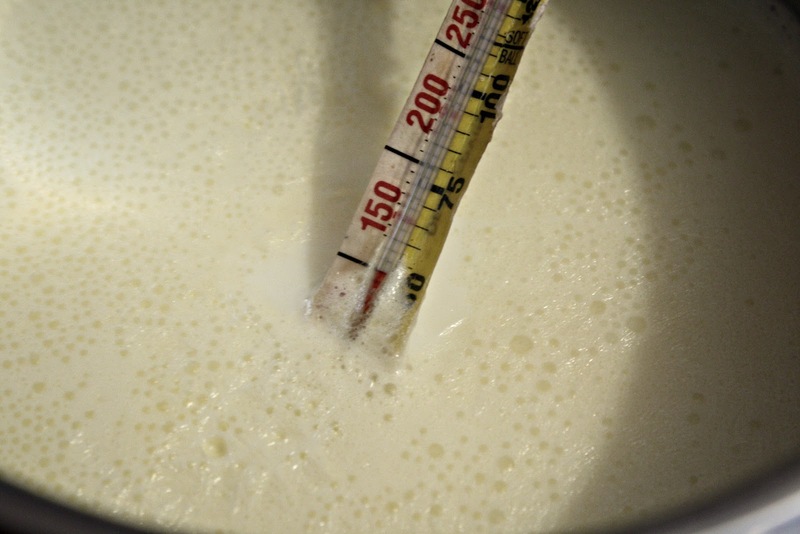 Heat the milk to 180 degrees F; just before it starts to boil. For me it takes about 10 min. But it really just depends on how low your heat is and the size of your pan. Remove from heat. Preferably your thermometer would be attached to the side of the pan and not resting on the bottom. But if yours is broken and rests on the bottom like mine be aware that the temp will read higher then it actually is. Just make sure you lift it up a bit every so often to get the correct reading. You could just buy a new one. But that would be too easy. 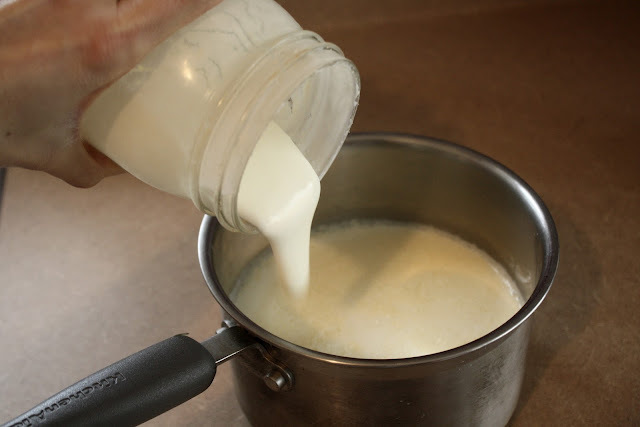 Add your plain yogurt or yogurt starter to the warm milk. No more than 1/4 cup of yogurt is necessary. I have never used a yogurt starter. I just use store bought organic plain yogurt for my first batch. Gently stir in the yogurt with a wooden spoon. Metal spoons have been known to kill live cultures. 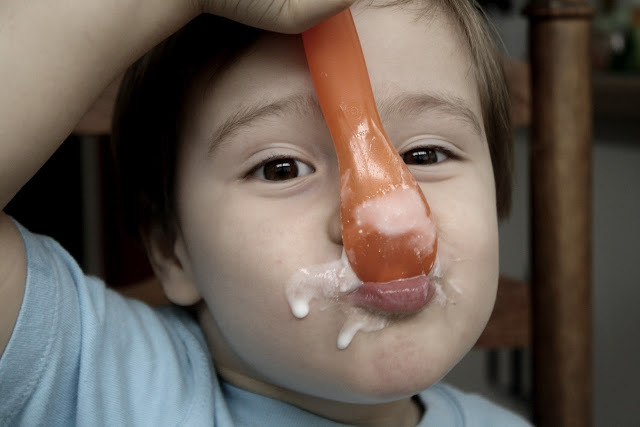 Although, I did use a metal spoon before I learned that, and never had an issue. 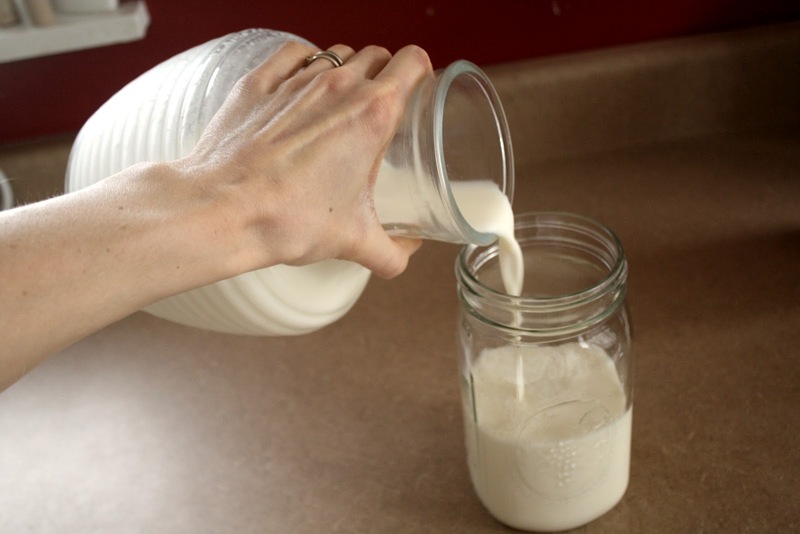 Pour the warm milk and yogurt mixture into the 1 quart glass jar. It MUST be a glass jar. Because the milk is pretty warm it would make a plastic container seep chemicals. Put on the lid VERY tightly. Put the jar into the center of your 2 gallon jug, and add hot water almost to the top of the jar. I have had fine results just using my hot tap water, which gets up to 150 degrees F. If you have to, you can add a bit of boiling water to the tap water. Be cautious though. While pouring hot water on glass you must go very slowly to make sure it doesn't break! Tighten the jugs lid, and let sit on the counter for at least 5 hours. I usually let it sit longer, sometimes over night. After letting it sit for 5+ hours, remove the jar of yogurt and put right into the fridge to cool. I have found that it makes for a thicker yogurt if you cool it first before eating. That way the extra whey can settle on top and you can scoop it off before mixing. It is definitely tart just plain, and will need a sweetener. We use honey or stevia. That's it! It's one of those things that sounds to scary to even try, but it really is pretty simple. So be a little adventurous and give it a go! 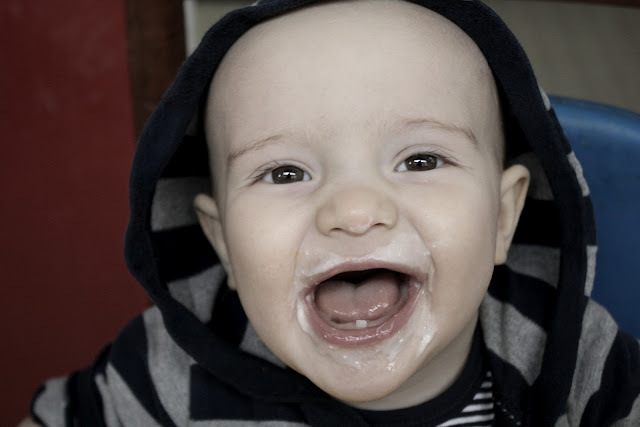 Here are Sam and Will enjoying their yogurt!